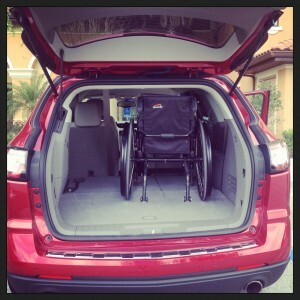 You are here: Home / reviews / How Does the Chevy Traverse Work With a Wheelchair? How Does the Chevy Traverse Work With a Wheelchair? When we visited Florida for Spring Break Chevy was kind enough to loan us a brand new Traverse for the week as part of a campaign with She Buys Cars so that we could experience how it would work for our family and, specifically, Carter. You may remember that I was *this close* to buying the Traverse a few years ago but Carter just did not have the strength at that time to make the transfer with the seat height difference from his wheelchair to the car seat. I was nervous about that going into this test drive and worked on simulating it in physical therapy for a few weeks prior to the trip. I need not have worried. His gigantic arms are more than strong enough now. Look in the video at how long his arms have gotten–74 inches at last measure! He certainly isn’t a little kid anymore and his arms are longer than Connor’s now. So, now that we know Carter could make the transfer with someone else loading his chair into the car…what else? It’s Got Style. I love the body of this car. It looks less like a minivan and more like sports coupe. The crystal red color of the one I test drove was fun and I loved the way it made me feel like I wasn’t driving a “grocery getter”. It’s Got Pick Up. This little baby has some get up and go with 288 horses under the hood making driving it fun and less of a mom chore. I like the way having that power feels under the pedals. It’s Got Room. The Traverse seats up to 8 people and has a Smart Slide feature that makes getting into that third row a little easier. With the third row down in this car we were able to fit 6 overstuffed suitcases and a non-folding wheelchair. That’s pretty impressive. It Will Keep You Charged Up. The backseat has electrical outlet that I was able to plug my iPad charger in, keeping my iPhone charged quicker than any adapter could. If you have the typical charger the cord is long enough to reach the front seat just fine. It was great for my son’s DS charger as well. I was surprised this Traverse did not have a USB port so having the regular outlet really saved me. It Keeps You In Touch. One of the first things you notice when you get in the Traverse is the huge 6.5 inch color touch screen MyLink display. At first it is pretty intimidating but within a few minutes of playing with it I had the Bluetooth hooked up to my iPhone, the satellite radio going and the navigator all set. It Makes You Feel Safe. Hands down one of my favorite things about a Chevy is the ability to have OnStar integrated into the car. I love OnStar so much that it was the number one consideration in our car choice for Connor. In addition, this car feels heavy and solid. 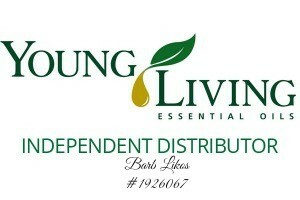 It has available All Wheel Drive which is important in places like Denver, where I live. Side curtain airbags and rearview cameras added to my feeling that we were safe and sound driving an unfamiliar car across Florida last week. My family really enjoyed our week in the Traverse. It was stylish, fun, and comfortable. My boys are all over 6’3” and none of the three had issues with head or leg room. There is a seat height difference of about 10 inches that needs to be considered for any mobility challenged passengers. 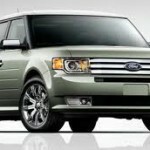 My son, who is a full-time wheelchair user, had very little difficulty transferring into the Traverse but if you think your family member would have an issue with this, please check out the reasons I bought the Ford Flex a few years ago. The Chevy Traverse is a car I would buy if we were in the market now without hesitation, and absolutely in the crystal red. If you are reading this because you too may be shopping for a vehicle that will work for a wheelchair using passenger, please check out the video below and see if this transfer is possible for your situation. I love those GM Traverses, great cars for travelers as well! 288 Horses can get you places quick.